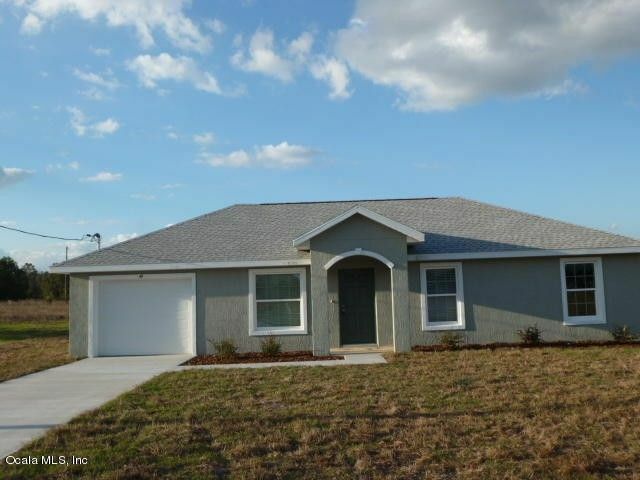 NEW CONSTRUCTION in Popular area in Ocklawaha! High & Dry, peaceful area close to many small lakes. You will love this new starter home, vacation home or retirement home. Just enough home to enjoy but not be tied down to. Nice kitchen with upgraded wood cabinets, stainless steel smooth top range, dishwasher & microwave. high ceilings, luxury vinyl plank in kitchen and baths, carpet in living area and bedrooms. Popular gray color scheme. Inside laundry room! 1 Car garage with opener. Plenty of space to roam around. Bring your boat, ATV's and fishing poles. USDA Loan area with no down payment if you qualify. Easy commute to The Villages or Ocala. Directions: From Belleview take CR 25 East thru Ocklawaha to Bay Rd. TL to 113th St RD. TR to Fisher Rd. TR, Fisher Rd dead ends into Malauka Rd. TR to Maple Dr. TL on Maple and follow to home.